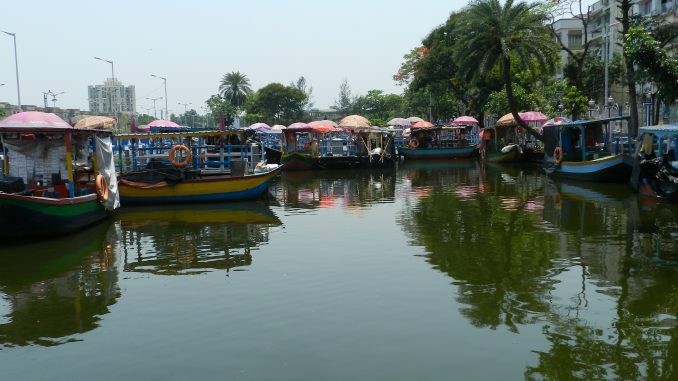 Can Kolkata’s floating market remain afloat for long? In January this year, the Floating Market, the only one of its kind in eastern India, came to life in the Baishnabghata Patuli area in Kolkata. With almost 114 boats docked next to the long, winding, wooden jetty, dissecting the Patuli lake through the middle, this Floating Market, selling fresh vegetables, fruits, fish and poultry was an idea borrowed from Bangkok’s floating markets by the state Urban Development Minister, Firhad Hakim. Unlike Bangkok, there is no provision though to shop around in a boat here and neither are the sellers mobile, but that hasn’t stopped people from afar to throng this unique market for an evening outing in the weekends. But on a Saturday morning at 11 am, when most other markets in the city would be buzzing, silence ruled. There were only around five people walking around buying vegetables and another five college kids looking for the best locations for selfie ops. Otherwise, the market wore a rather deserted look. Shopkeepers informed us that the scenario wasn’t any better through the week. 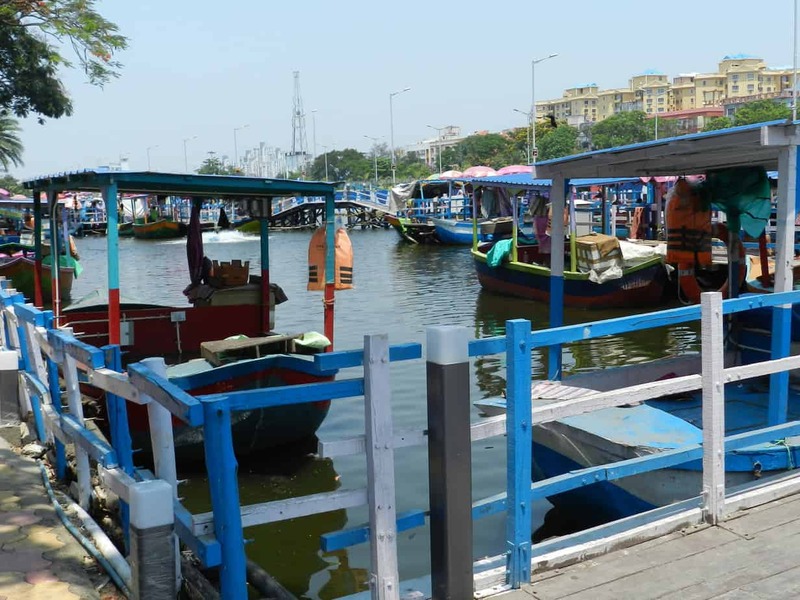 Ironically, the Patuli VIP Bazaar – where most of the sellers in the boats today had done business for more than 20 years and which had to make way for the widening of the Eastern Metropolitan (EM) Bypass — would have been bustling with customers at 11 am. Locals say that the Patuli VIP Bazaar located on either side of the EM Bypass cropped up almost three decades back when Patuli was a very sparsely populated area. 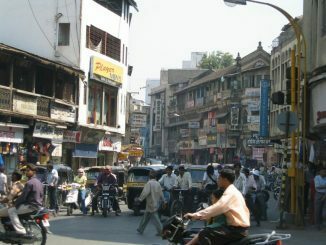 As the township developed, the bazaar also saw more sellers making space for themselves till it became the only large market in the area. However, the market had developed unsystematically and came in the way of the widening of the EM Bypass, the main connecting thoroughfare between the northeastern and the southern extremes of the city. 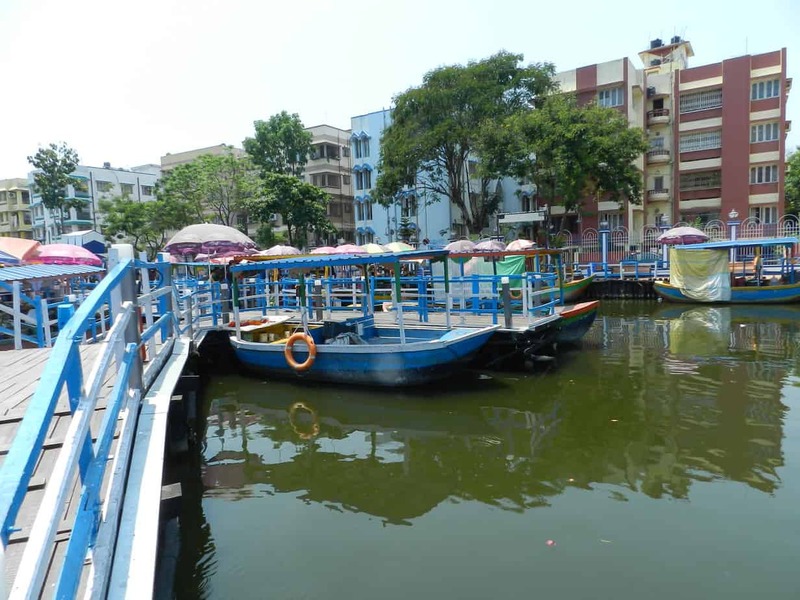 When the vendors at the bazaar were rehabilitated in this Floating Market, reportedly constructed with an investment of Rs 6 crore, they happily looked forward to a new beginning. As one walks into the market the yellow, blue, pink giant umbrellas spread across the jetty and the colourful boats full of red, green and orange vegetables and fruits create a warm and welcoming atmosphere. But once you per close enough, the cobwebs at the edges of the boat seem more settled than the sellers themselves. As such half the boats are empty, but those that are occupied have people who are uncertain about what the future holds because business is rather dull. Kalidasi has a vantage point. She occupies a boat right next to the entrance selling coconut water. Her price is reasonable at Rs 25 a coconut for water that is sweet and brimming. But she says her business has gone down drastically and she does not know how long she will be able to survive. “No one is coming here to buy,” she rues. The April sun makes matters worse. 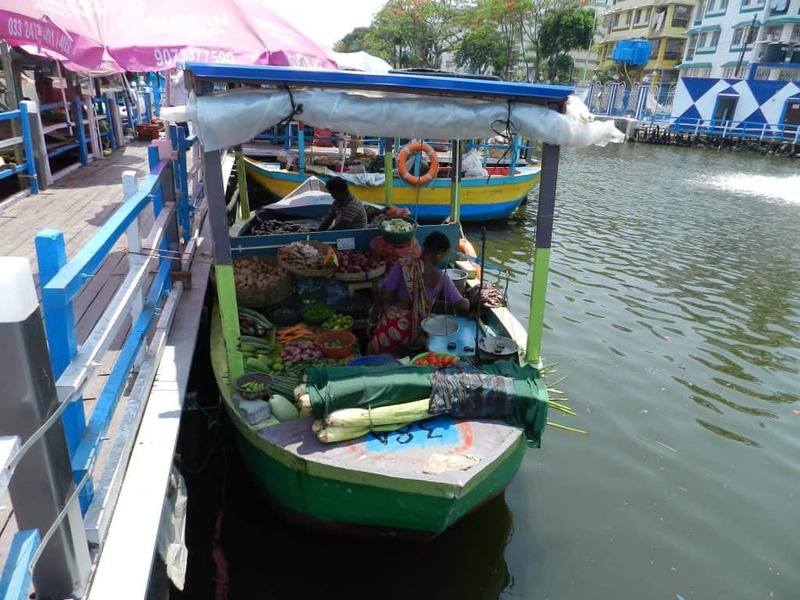 While electricity meters have been installed and small table fans whir inside the boats, the buyer has to stand in the blazing sun on the jetty to do his shopping. Things are expected to become worse as the rainy season approaches. “The recent Norwesters in the evenings have already given us an idea of what’s to follow. A few days back, as the storm raged, my boat was rocking violently and I had no way of saving myself from the angry winds in this open space,” says Kalidasi. R Roychowdhury, who lives in the neighbourhood and was braving the sun to pick up some vegetables, is a regular at the market but he blamed the Bengali need to touch and feel and check for freshness before buying, as one of the major reasons behind the slump in the market. 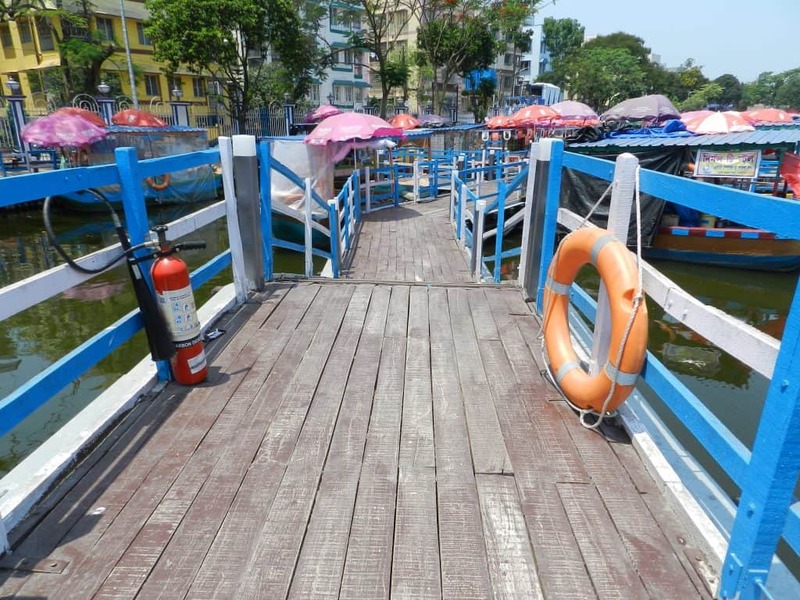 The entire walkway is fenced, so that a buyer cannot step into the boats. “Because of these railings that run through the jetty no one can get down into a boat and check the vegetables or the fish, so most people are not interested to come here,” said Roychowdhury. Another seller pointed out there is no way that gaps can be created in the railings to allow access to the boats, because the water in the lake is rather deep at 10-12 feet and there would be risks of people or children falling into the water. As such children below six years are not allowed in the market. Hence most of the regular clientele that the sellers enjoyed at the Patuli-VIP Bazaar have switched loyalties to other nearby marketplaces, such as Garia Bazaar or Jadavpur Bazaar. Gita, a vegetable seller had been assigned a boat but in the last three months, she incurred a loss of Rs 6000. So, she has folded up the vegetable business and has instead decided to sell phuchkas (a famous Kolkata street food akin to the paani puri or gol gappa). She said she wasn’t yet sure if her new phuchka business would cover her house rent of Rs 2000 a month plus electricity bills, and still leave her enough for food and other needs. But at the moment the footfall is so low in the market that most of the sellers are worried how things will turn out in the long run. 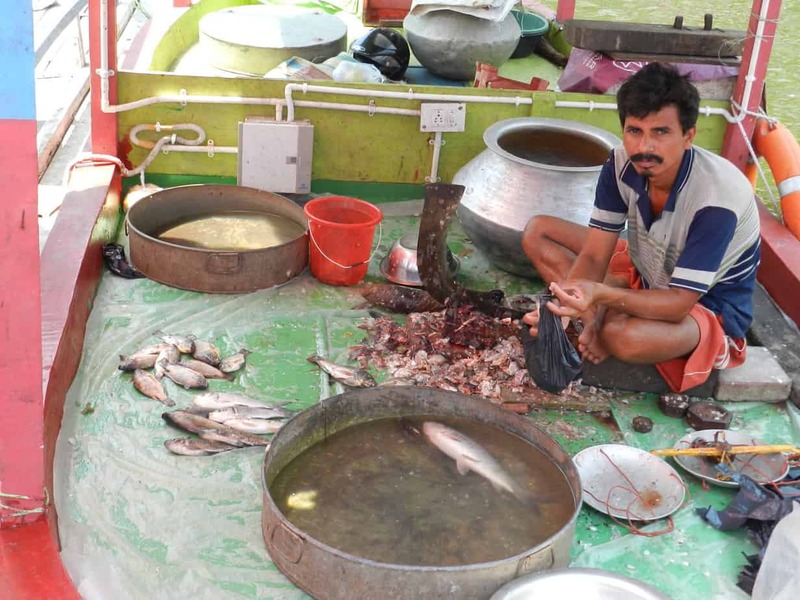 Many have had to just discard their unsold goods because they perished or became unfit for selling and one fish seller was even grappling with the theft of his entire stock of Hilsa fish the night before. “We leave our unsold stuff covered in the boat. There is security here. But we don’t understand how the fish was stolen despite the vigilance,” said Rabi. There were supposed to be 280 shops on 114 boats but many of the boats are empty at the moment. A fruit seller informed that the boats would be allotted to more sellers soon to make the market a more busy space. Apart from food items there are tea shops, shops selling nightwear for women, bedding and costume jewellery and basic cosmetics but all the shop owners complain of dismal sales. Many of the boats are still empty. “The place looks beautiful in the evenings with the boats decorated with strings of light. People walk around or sit on the benches but very few people buy anything,” said a bedding store owner. What does strike one about the Floating Market is its cleanliness, something that can never be achieved in a normal bazaar selling fish and vegetables in Kolkata. The sellers are following stringent regulations of collecting all their waste material and depositing it in a designated bin. In a pleasant surprise, even visitors don’t seem to be throwing plastic or food in the water. Hence the water looks clean. 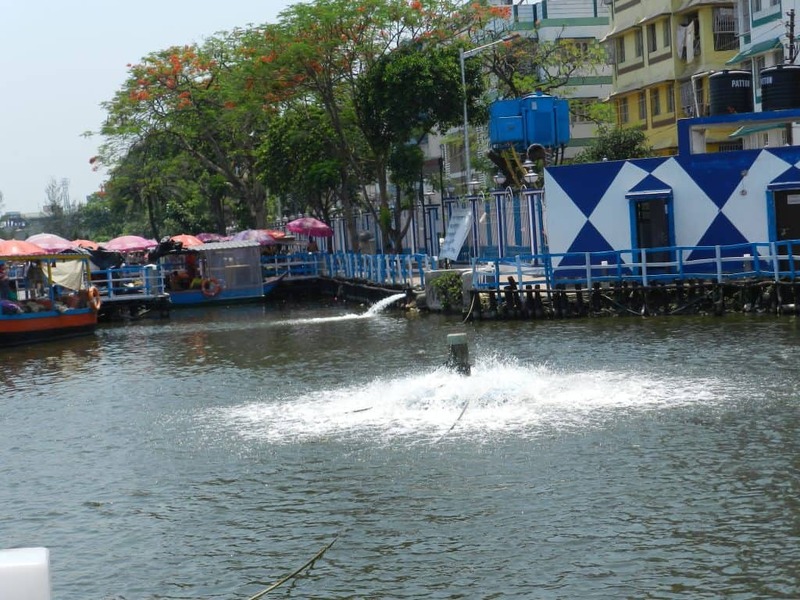 The two aerators working 24X7 is helping matters by pumping oxygen into the water. It’s hard to say if marine life is thriving under the mossy green surface but fish seller Rabi does think that the live Rohu fish that escaped from his boat a few days back must have liked its new home. Within four months of its opening the market has notched up 1628 Google reviews and an overwhelming number of them are positive, talking about the good quality of the products sold, competitive prices, cleanliness, which includes a clean toilet, and its possibility of becoming a major tourist attraction. While walking around the market one can’t help but notice that much thought has gone into emulating international standards. There are life jackets hanging from every boat and lifebelts hanging all over the jetty. There are fire extinguishers also at regular intervals and the sellers are being regularly sensitized on cleanliness. Fire extinguishers and life belts dot the wooden walkway. The market is indeed a unique effort at rehabilitation but unless the sellers’ woes are addressed, the survival of the market will be in jeopardy. There has to be a new plan of action that will enable buyers to step into the boat. More shops should be opened targeting the people who come to visit the market just to check out the place. Unless quick steps are taken, this wonderful Floating Market may not, unfortunately, remain afloat for long. [All pictures have been taken by the author]. Why is IIT Kharagpur training driving instructors from Kolkata and around? 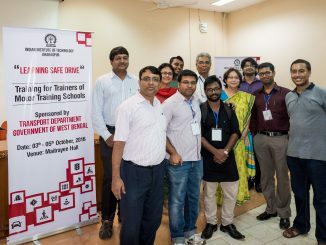 Close to 450 driving school trainers from Kolkata and other districts have been trained under a programme piloted by the premier institute under the ‘Safe Drive Save Life’ campaign of the state government. The mission: to promote a culture of safe driving by training the trainer. 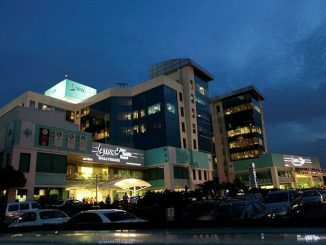 In a year of frequent face-offs between hospitals and citizens, the urgent need for regulation of the private medical sector has become obvious, but attempts in West Bengal and Karnataka have not had heartening results.